TBD impresses upon clients how important it is to have a theme or plan broken down annually, quarterly, monthly, weekly. With a strong grip on the long-term strategy, the day-to-day stays on track and reaches for that overarching goal. In 2018, we wanted to bring that idea to the creative team as well. Our graphics department and capabilities have grown, as has our understanding of omnichannel (across all media) storytelling. For example, check out our refreshed Instagram! Our goal was to exemplify the power of a story. Each month we’re taking a deep dive into a word or topic of focus as a company, and relating it to our bigger picture. How do we represent that visually? With a bigger picture, of course! We loved experimenting with a collage format that could accommodate 12 individual posts that also worked together as a whole. 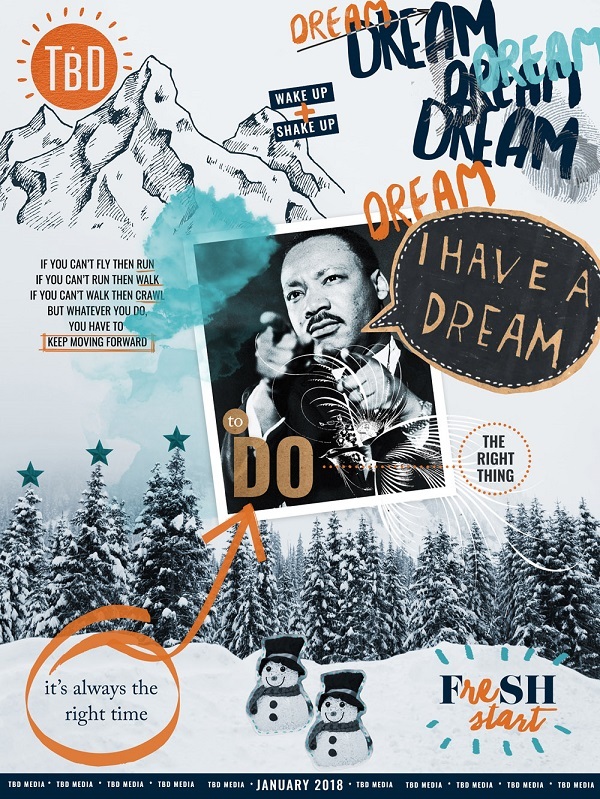 For January, we used the ever-inspiring Martin Luther King, Jr. as our focal point, as well as a springboard into adjacent thoughts and ideas. Dreams were a big part of the theme this month because TBD is excited about so many our dreams manifesting and becoming reality. In 2018, we’ve fortified our skills and added to our arsenal of talent. Our graphics team has expanded and we’re excited to offer full-service design options from print to digital. Our team can develop and design just about any template, logo, custom grid, postcard, menu, banner ad, social media suite, and more. You name it, we’ll do it!